A lot has been written about Ander Herrera’s future the past month. Paris Saint-Germain are said to be mooching their way in to promise silly money, with Manchester United reluctant to meet the player’s demands. So, when Herrera tells ABC that “today, Manchester and I aren’t thinking the same” it gives the impression they are some way apart from finding an agreement. United will feature frequently in the Spanish newspapers this week with their Champions League quarter-final first leg with Barcelona on Wednesday night, but ABC went one step further to get an interview with Herrera. Herrera did not train with the squad today at Carrington, as noted by Manchester Evening News reporter Samuel Luckhurst. The Spain international said he wants Paul Pogba to stay at United. Although it seems inevitable that Pogba will one day leave United, claims that Herrera could leave for PSG on a Bosman this summer came as a shock when the news initially emerged. 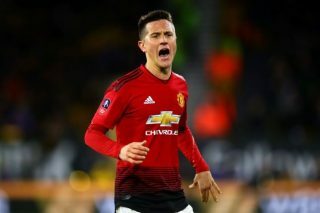 Herrera was asked about his future, to which he responded: “It’s true that I only have two months on my contract left, and today, Manchester (United) and I aren’t thinking the same and there is no renewal agreement, but my duty is to keep listening to United. So, there you have it… Herrera confirming that there’s a possibility he won’t be at United next season.